There is a high prevalence of cardiovascular disease ( coronary heart disease , stroke , hypertension ) in this area, mainly due to the high intake of saturated fats, cholesterol , and sodium. Stomach cancer is also very common due to the high intake of salt and salt-cured foods, especially salted fish. Accidental injuries are the largest cause of death for individuals under forty-five years of age. Suicide and alcoholism are also prevalent, and obesity is on the rise. A Dutch man eats raw herring, which is a delicacy in the Netherlands. 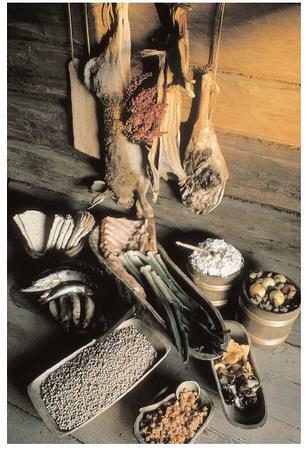 Seafood is an important part of the Scandinavian diet, but it is not always eaten raw. Popular preparations include smoking, drying, pickling, and salting. Long winters and short summers limit the fruits and vegetables available to Scandinavians. Their diet tends to be high in fat and salt, and includes such exotic fare as reindeer milk, whale steak, and lutefisk. Midsummer's Day (June 24) is another popular holiday in Scandinavia. It features maypole dancing, feasting, and bonfires. Fish, such as herring and cured salmon ( gravlax ), along with boiled new potatoes are common. In Norway, a cream pudding ( rommegrot ) is served with cinnamon and sugar. In Sweden, wild strawberries are eaten.